The goal of mucogingival procedures is to obtain complete root coverage, up to the cementoenamel junction, along with an increase of soft tissue thickness to maintain the result in the long term, reducing the risk of recession recurrence. The use of a coronally advanced flap in conjunction with a collagen matrix avoids the need for autograft harvesting, thus reducing patient morbidity and discomfort. The collagen matrix will support blood clot stabilization by serving as a scaffold for ingrowing blood vessels and fibroblasts; within a few months, the matrix will be completely degraded and the blood clot will be gradually transformed into new connective tissue, which will be responsible for the increase in soft tissue thickness. This represents a key aspect of the long-term success of root coverage. 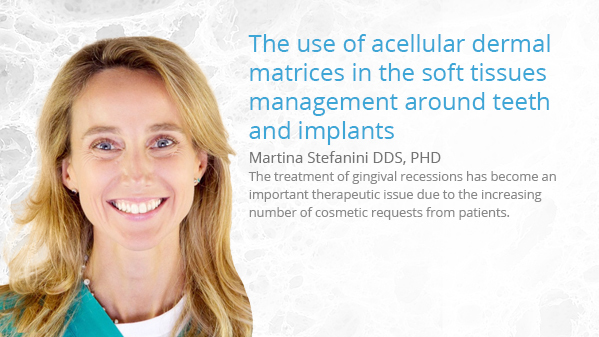 The use of a promising porcine acellular dermal matrix for peri-implant soft tissues thickness increase as well as its long-term clinical outcome will also be described.